Valentine’s Day. Love it or loathe it, there’s no escaping the foray of pink hearts and red balloons that are flying around at this time of year. Promises of candlelit dinners or home-cooked meals, roses, chocolates, the lot. Whether you’re celebrating with your significant other, or coming together with friends to have cocktails and cake, you need to know what to wear right? Everyone knows how to throw on a nice dress and heels, so I thought I would explore some other options in case you want to mix it up a little. Let’s face it, you can’t beat a statement coat. You could be wearing your pyjamas underneath or a t-shirt that is so old that you’ve forgotten about where it came from (we’ve all been there). But if you throw over a great coat, you’re good to go! This bright pink number is from Zara a few years ago, but there’s no escaping them on the high street at the moment. Pink not your thing? You could go for red, blue, yellow, the possibilities are endless. Keep the rest of the outfit simple with a nice top, jeans and a classic pair of boots. I’m a big fan of mixing textures together, especially opposites such as leather and velvet. The blush pink velvet really softens and feminizes the leather, while the leather stops the velvet from looking too twee. Perfect partners in crime! To keep this look lowkey, I’ve gone for a pair of flat pastel brogues and an oversized cardigan (borrowed from the boyfriend of course), for a perfect combination of smart and casual. Of course, you could dress this look up by adding a pair of black court shoes or a blazer instead of the cardi. So it works both ways, whatever the occasion. Slogan tees have been everywhere the last year or so and this vinyl Mango number is one of my favorites. ‘Romance’ is adorned in red, pretty apt for this time of year, and it can easily be dressed up or down. Tucked into this tassel skirt from New Look, it’s the perfect combination of dressy without being “try-hard”. To stop it looking too girly I’ve teamed it with a pair of black ankle boots, but of course, you could swap them out for heels if that’s your bag! To finish off the outfit and to bring out the red and pink touches, this Mango bag does the trick. I love a good colour clash! A slicked-back ponytail is a great way of showcasing this lovely polka dot bodysuit from Stradivarius. I normally curl my hair but thought this swept back hairstyle would make the outfit stand out a bit more and make it look less girly and more modern. 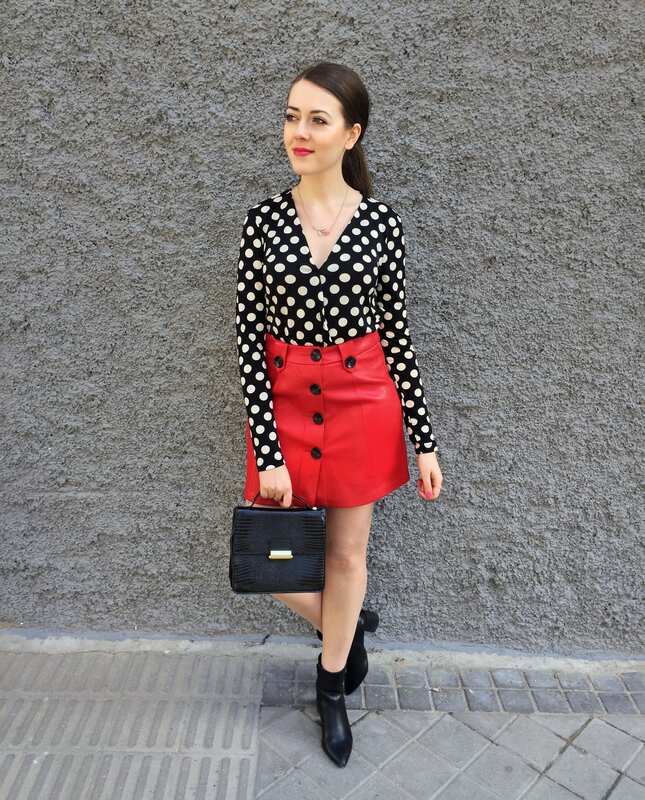 The red vinyl skirt is also a recent edition and I love the contrasts of the bright shade with the polka dots. It makes a statement without being too much. I can also see myself wearing this outfit with black tights, flats, and an oversized cardigan. 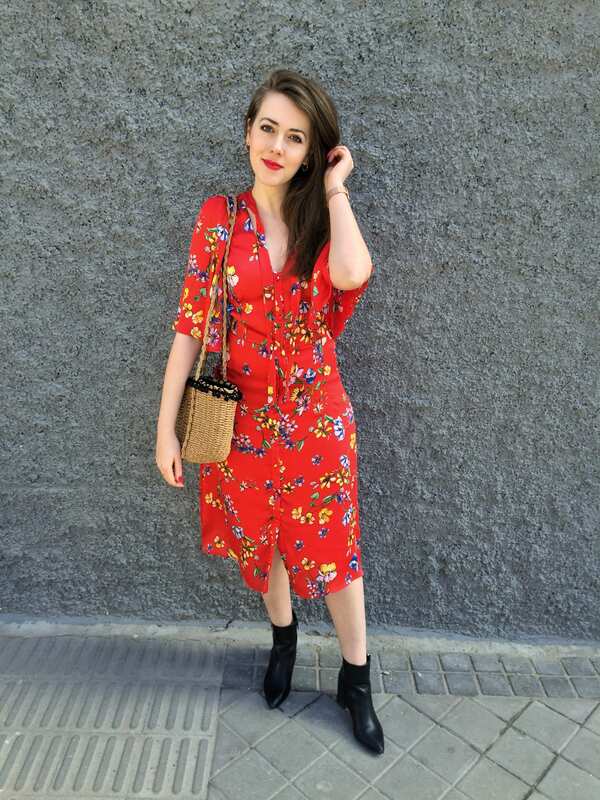 This floaty dress is really making me dream of spring! With windswept messy hair and a pom pom picnic basket, it’s the perfect combination for a day date, maybe to the park or to meet for coffee or lunch. The ankle boots stop it from looking too ‘Little House on the Prairie’ and make the look a bit more wearable in a city environment. To dress this one up, you could swap out the basket bag for a black bag and the ankle boots for a pair of classic heels. To see all of the outfits in action, make sure to watch the video below. Let us know what your favorite look is and what your plans are for Valentine’s Day! 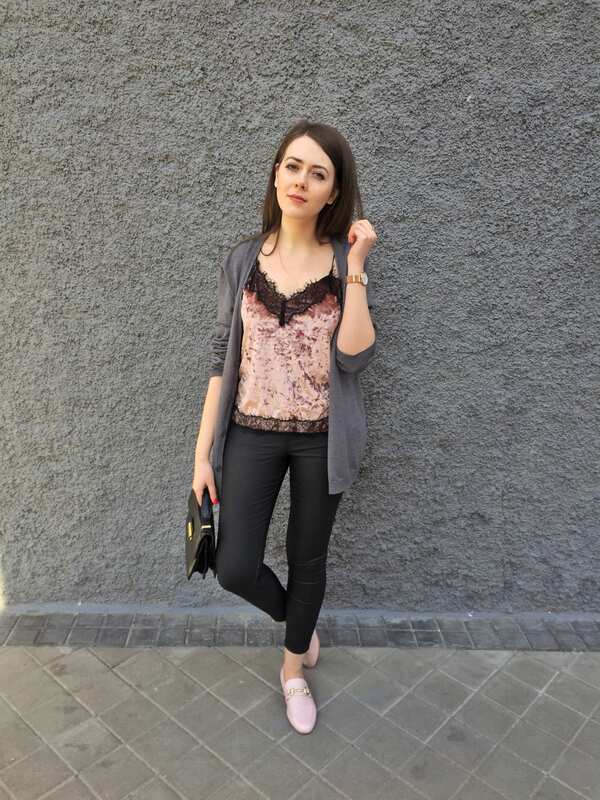 For daily outfit inspiration (& long-winded captions), head on over to Orlagh’s Instagram, @orlaghemily and say hey! A big believer in wearing what you want, when you want to. Her personal ambitions include wanting to own a coat in every colour and owning all the ankle boots.